Trolls are supernatural rock beings in scandinavian folklore. Many trolls lived in the magical realm. They appear to mainly be made up of a large mass of stones that, when put together, form a humanoid body. Moss also grows on their stone bodies. Trolls are extremely strong and large.However, this makes them slow and they can also be easily fooled. Like elves, they can also speak English. Trolls tend to pick up the first heavy thing they see (normally rocks) and throw it at whoever they see as a threat. But that means they could easily be outsmarted. If someone stands above them while they are preparing to defend themselves, they will throw the stone straight up and it will fall back down on them. Also, if someone were to approach them while they are unarmed,they will immediately lumber over to grab a boulder, oblivious to nearly everything, including a Poptropican jumping on them. 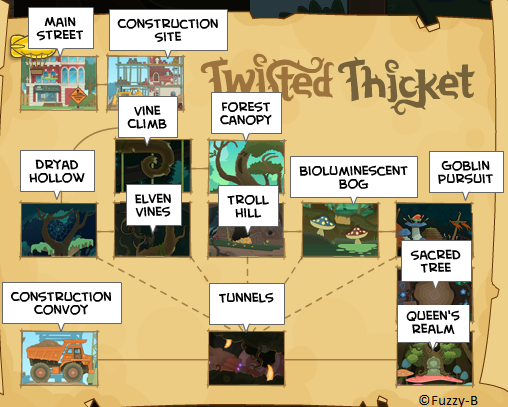 Concept art of both the trolls and the Nokken from Twisted Thicket are displayed on Ashley Lange's portfolio. 3 separate designs are shown, with the second being adapted into the final version appearing in the game. Noticeable differences include the nose which was ultimately removed, as well as the horns which were made brown and angled forward. A sillhoutte of a troll seen in the Twisted Thicket trailer. According to the Poptropica Tips and Tricks app, the troll at the top of the mountain is the Troll King. A silhouette of a troll is seen in the Twisted Thicket trailer. There is a members-only troll costume. The trolls bear a slight resemblance to the Oasis Dragon from the Facebook game, Dragon City. Their yellow eyes are shown to glow in the trailer. The trolls bear a striking resemblance to the giant Tree Rex from the 2012 game, Skylander's Giants. Oddly, when a troll turns around, it's broken horn switches places with it's intact horn. So do the scars on their faces. A miniature figurine of a troll appears in PoptropiCon Episode 2: Spoiler Alert. This page was last edited on 11 March 2017, at 15:50.